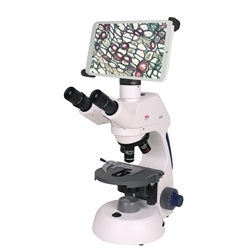 Swift trinocular M15T-BTW1-P tablet microscope offers infinity corrected optics, making these microscopes ideal for college laboratories, veterinary and medical applications. This research level microscope has a bright 6v, 20 halogen illumination system and wide 20mm field of view eyepieces. Body: Trinocular Siedentopf head provides larger interpupillary range and is ergonomically positioned for operator comfort. Heads are inclided at 45° for ergonomic viewing. Ergonomic carrying handle promotes proper handling. Quality manufacturing and all-metal interal parts, along with glass optics provide durability. Instrument is finished in acid and reagent resistant Swift epoxy-ester resin. Objective Lenses: DIN standard Infinity Corrected 4x, 10x, 40x, 100x (oil) objective lenses are parfocaled and parcentered. Mounted on inward-facing (reversed) rotatable nosepiece. 40x and 100x objectives are spring loaded and sealed to protect optics from contact or oil damage. Eyepieces: Widefield 10x eyepieces with an 20mm field of view. Accepts 21mm diameter reticle, retaining ring required. Specimen Stage: Slow-closing, slide holder clip on mechanical stage minimizes slide breakage. Condenser: Abbe 1.25 NA DIN Rack and Pinion condenser. Shield protects iris diaphragm from damage. Focusing: Coarse and fine focusing allows fine-tuned focusing. Focus-tension knob offers light touch sensitivity for extremely precise focusing. High grade synthetic lubricants are used to provide smooth, precise operation. Illumination: Corded 6v, 20w halogen illuminator. Dimmer switch allows for variable intensity control. Tablet: Includes 8" tablet that connects to camera with mini USB to micro USB cable. Camera is CMOS sensor with live resolution of 800x1280. 5mp capture to micro SD card. Video capture resolution 720P. Tablet uses MoticConnect App. The camera works with Motic Images Plus 3.0 software for windows, OSX and Linux. Warranty: Swift Optical Limited Lifetime Warranty covers defective parts and workmanship for the life of the instrument.